Apex White Labels | Shaped for success! Would you like to be a casino owner? We’ll make it happen. 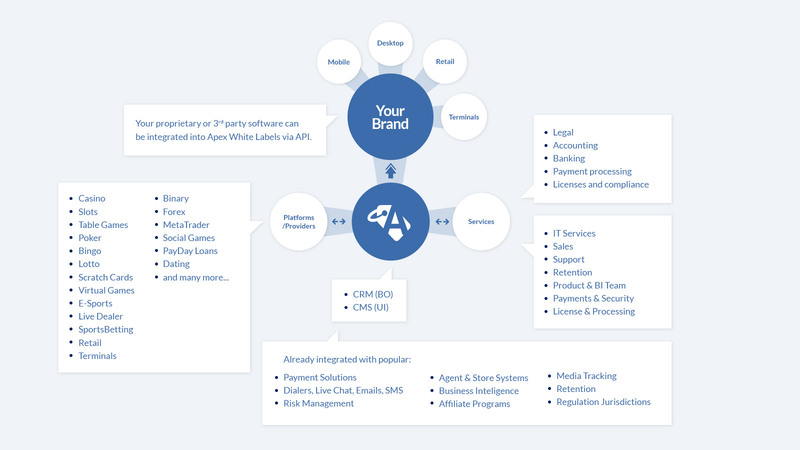 The White Label solution package provides you with our fully managed solution plus the following additional services: payment processing, license, compliance and banking services. Specifically designed so that you can take advantage of a flexible software solution. clear communication and long-term relationships with key clients. Caring about our clients doesn’t cost. It pays. We get the results we do because of our technical know-how, deep industry knowledge and solutions that are agile, flexible and customisable to you and your needs. Reach out and discover what you’ve been missing: peace of mind, partners you can count on to get the results you’re looking for and ironclad data protection. Apex clients value us because we stand by our values of accountability and dedication to client goals. We are the dominant B2B software and business management solutions provider in the gaming, fiancial and retail industries. We're here for you. It's that simple.